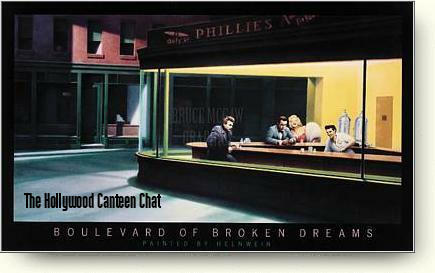 You may select an icon below, click the Hollywood Canteen button and come into the chat! (This section is not quite ready yet.) Hello. I'd like anyone who would like to contribute to this section to please do. I will post your comments and if you prefer to remain anonymous, then you may. Have fun, that's the main thing! This site is best viewed with Internet Explorer and a screen size of 800 x 600 pixels. To change your settings, right click your mouse on your desktop and then hit properties and then settings.